HJSPLIT is small (even less than half MB) but very powerful and useful software.It can split large files (even more than 10 GB) of any type into small parts of any size.It can also join these file parts easily in few seconds. It is very useful software because many times this situation occurs when we have to transfer big files from one PC to other PC using pen-drive but size of file more than capacity of pen-drive, then we can use this software to split file into parts and and transfer these files and again join these parts into one file in other PC.This software is also useful to people who upload files to internet. You can also use this software to compare to files and to get MD5 Checksum of any file. HJSPLIT is a freeware software(Free for private/personal use and free corporate (business, government, non-profit, etc.) use) that can run in windows 9x/ME/NT/200x/7/Vista/8 32bit/64bit.It can also run in Linux/Wine.You didn't need to install it, just double-click it. You can download it for free from its homepage "www.hjsplit.org" or "www.freebyte.com". 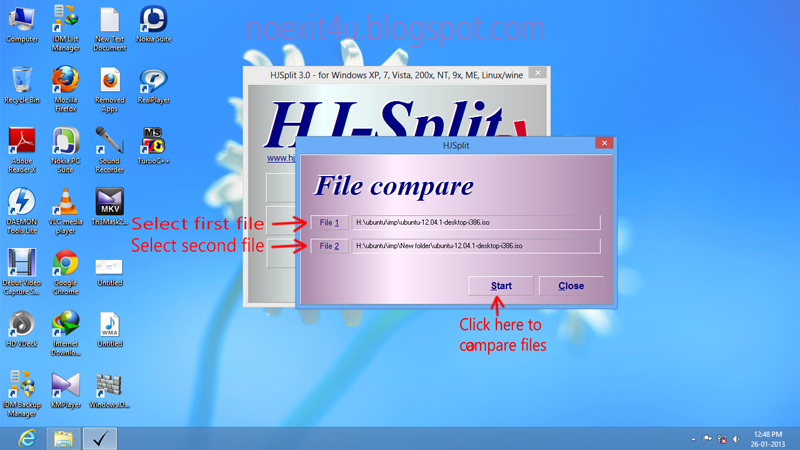 1.Open HJ-Split and click on "Compare" option. 2.A new window will open, select files that you want to compare and click "Start". 3.You can see progress of comparison. 4.After completion of progress, a message pop-up will come that tell you about the files that they are equal or not. 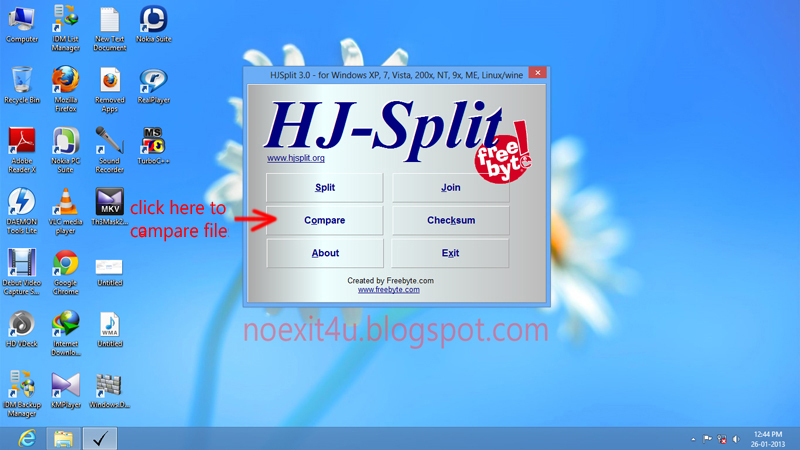 click to know "how to join file parts using hjsplit"
click here to know "how to find MD5 check-sum of any file using hjsplit"
click here to know "how to split files into parts using hjsplit"
For any query or suggestion please comment below.